This image comes from the official website of U.S. Senator Harry Reid (D-NV). 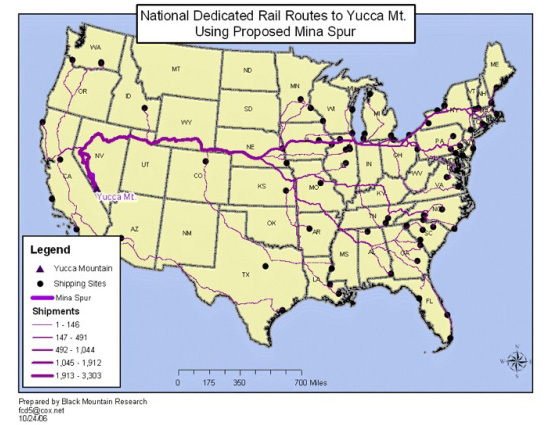 It shows the proposed rail route radioactive waste will take if and when the proposed Yucca Mountain Repository becomes operational. As graphically depicted, it begs easy comparison to the Mississippi-Missouri river system. Rivulets and tributaries and one big fat branch sweeping across the landscape, meandering as they transport their cargo inexorably to their destination, dutifully following the laws of gravity but a lot of the times not, and with and against the will of the people. Both are considered very important to national security and therefore must be controlled. The river, of course, has its dams and levees and navigational locks, courtesy of the Army Corps of Engineers, but it also has a proto-nervous and proto-immune systems constantly monitoring any abnormal levels of natural activities, which, if detected, will be taken care of by a cadre of engineers. The rails will no doubt have its own security barriers, a surveillance system and a disaster management protocol. And therein lies our main reason for posting the map: we want to propose a landscape architecture studio in which students are tasked to design the landscape of this radioactive corridor, which must be occupiable public open space, and thus will have to balance (or not) the demands of security and access. Will they be inspired by Israel's West Bank barrier or North Korea's DMZ or both? Will they create the country's longest and thinnest national park with an outer layer of well-infrastructured recreational area and an inner layer of restricted wilderness? Or will the whole thing be just a constructed wetland filled with Bird flu-West Nile hybrid superviruses that even terrorists are scared of? Perhaps in imitation of Gertrude Jekyll, one designs a thick, fury border of native vegetation transcoded with phytoremediating genes. And interspersed along these rows of explosive biodiversity, in equal distance from each others like grain elevators, are sentinel towers housing landscape architects charged with maintaining the greenbelt. In any case, if and when shipment begins, it would be interesting to travel to all those farming towns and those vast, horizon-filled counties lining the rails just to ask what the people now think of those very evocative sounds of bullhorns rolling across the landscape. Will they still be rendered nostalgic for the heroic past, half-remembering childhood stories of their great-grandmothers tending to their prairie homesteads, marking the passing of the day and the seasons by the passing of trains, sometimes waiting the delivery of their daughters' new Sunday best clothes ordered from Sears Catalog, always lulled to sleep by the distant sounds of metal wheels on metal tracks? Will the sound still call to mind the glamorous era of American intercontinental railway journey when the dashing Cary Grant and the lovely Eva Marie Saint drank champagne in plush, oak-paneled boxcars while evading cops, spies and double agents against the backdrop of the national landscape? Or do they now evoke nuclear holocausts, a country heading towards a post-oil crisis and Rob Lowe? The Romantic and the Pastoral landscape replaced by an anxious terrain in constant threat of a sonic blast.